Vietnam football looks set for a revival with the spread of training academies to boost the country's fortunes in future contests by recruiting and cultivating young players for the professional field. The model will be the Hoang Anh Gia Lai-Arsenal JMG Academy, in Gia Lai Province, which was built in cooperation with the Arsenal Football Club of the UK, JMG Academy and the Hoang Anh Gia Lai Corp. Fan numbers have been fading in recent years due to match-fixing scandals and losses in international contests. To regenerate the sport, the HAGL-Arsenal JMG Academy has nurtured such promising young players as Cong Phuong and Tuan Anh. Following this success, the Viettel Group built a 20ha sport centre and started recruiting promising players from across the country. Viettel has contracts with eight satellite training centres to recruit children aged from ten to 12, with outstanding candidates feeding into the main centre at the age of 13. Major-General Hoang Xuan Vinh, deputy director of the Viettel Group, said the company was working with Germany's Borussia Dortmund to set up an academy in Hanoi. "Dortmund has an excellent training model. Moreover, their playing style is also in synch with what we're aiming for," Vinh said. But the academy path is not a certain one. In HCM City, once home to a number of leading football clubs, such as Hai Quan and Cang Sai Gon, the football boom has gone into decline. It tried a training academy, set up by the HCM City Football Federation, Scavi Co. and French footballer Dominique Rocheteau -- the Scavi-Rocheteau Football Training Centre -- but the centre closed after five years. On January 31, Hoang Anh Gia Lai Corporation, Arsenal FC and NutiFood JSC joined hands to establish a new football academy in HCM City. Tran Thanh Hai, chairman of NutiFood JSC (left), Doan Nguyen Duc, chairman of Hoang Anh Gia Lai Corp (centre), and Jean Marc Guillou, founder of JMG Academy model joined hands to establish a new football academy in HCM City. "Hoang Anh Gia Lai-Arsenal JMG Academy has produced many outstanding players," said Tran Thanh Hai, chairman of NutiFood JSC. "NutiFood wants to be another partner to continue this success, producing more skilled players and contributing to Vietnam's football scene." 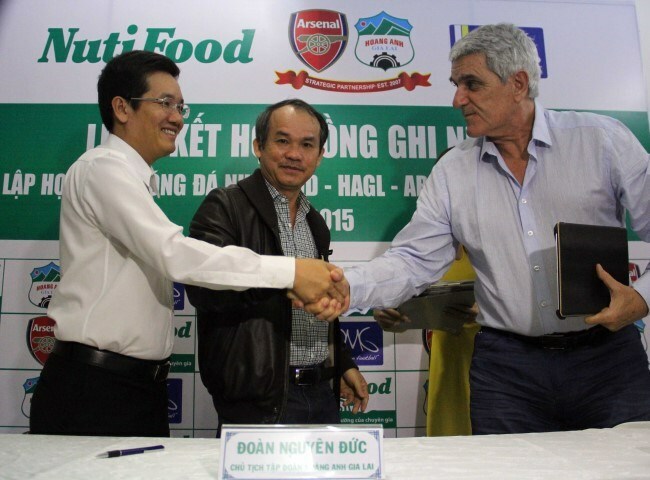 Doan Nguyen Duc, chairman of Hoang Anh Gia Lai Corp., said, "One Hoang Anh Gia Lai-Arsenal JMG Academy isn't enough to attract all the talented players in Vietnam, and we welcome NutiFood's help." The new academy will begin recruiting in June.